My seven-year old son has a special passion for studying anything related to the war in Viet Nam. He is always asking questions about "how the small Vietnamese soldiers could defeat big, tall enemies". To help him find the answers, we visit historic places and museums whenever we have free time. On these trips, we can see that the victories often depended on "all-people warfare." During the war, the liberation force built many unuderground bases far from central Sai Gon (now HCM City). But few people, even today, are aware that one base still exists in the heart of hectic city on a site easily undetected. The house at 287/70 Nguyen Dinh Chieu Street in District 3 was once used as an underground cache for the attack on the Independence Palace by the liberation commando force in Sai Gon during the Mau Than Spring 1968 general offensive and uprising. We first visited the house one early morning when local street vendors were setting up a daily market. If we had not seen a metal plate with the inscription "Historical Cultural Heritage of National Level", we would not have been able to locate the house, as it looked like the others and seemed to be hidden in the busy market. We could see that the house was long and narrow, and no more than 40sq.m in size, with an entresol (mezzanine). The house was so narrow that we, at first sight, did not believe that it had been used as a cache storing two tonnes of weapons, including AK 47s, handguns, explosive charges, grenades and various kinds of bullets. On two walls were red boards on which hung many pictures of the period during which the owner and his comrades built the store and transported weapons. Also on the wall was a special drawing of a house map. Looking at the map, we saw that the house owner lived his everyday life on the main floor and entresol. The secret weapons were stored in the attic and basement. On the first floor, my son especially liked the low, flat wooden platform, which is normally used for sitting or sleeping. Here, however, it was used to hide weapons as it could be opened like a book. Many guns could be put inside, and when it was closed, it became a bed. In the basement corner were farmers' daily tools, which had been used to cover up the weapons. An elderly woman visiting the house told us that she and several other comrades had carried and transported weapons from and to the house. At that time, she put weapons in a big basket and then covered them with vegetables and fruit, pretending to go to the market. In this way, she was not recognised. The entresol is now used as a place of worship for President Ho Chi Minh and soldiers who sacrificed their lives during the Mau Than offensive. Even though we were aware that there was a basement, we still had to ask the housekeeper where it was, as we saw no signs on the floor, which was covered with red and ivory enamel tiles. The woman told us the basement door was right under our feet. It was surprising because I could not feel anything unusual. The door leading to the basement was tall enough for only one person. Climbing down the cement stairs, we could see a basement 8m in length, 2m in width and 2.5m high. I was told that the basement was made with plaster and cement to protect the weapons from water. Dozens of guns had been carefully arranged and stored along the walls. During our one-hour visit to the house, my son was excited and surprised. We discovered that, to prepare for the offensive, the liberation commandos were given guidance in building stores to hide weapons and help prepare an army force. Following this plan, in 1967, an underground liberation cadre named Tran Van Lai bought the house, which had two doors opening on to two different lanes. Pretending to repair a water closet and a waste water ditch, Lai and his most trusted workers began to dig the area and build the cache. The task was so secret and dangerous that Lai concealed everything from his wife and children, whom he moved to Go Vap District while he stayed at the house alone. During this time, Lai was working for the Independence Palace as a contractor for the American U-SOM agency, which helped him cover up his task. During the day, he was a builder. At night, he dug the basement. The soil they dug up was put in carton boxes and transported to Binh Chanh District. The basement was completed in seven months. In the basement today, visitors can see four large framed holes that allowed people to escape to the city's waste water drainage system. Cars transporting weapons arrived at the house only at dusk. Sometimes they came to one door and sometimes they went to the other side to divert the enemy's attention. The cars entered the house in reverse, and then weapons were moved to the basement. At that time, nearly two tonnes of weapons stored in the basement to serve the Mau Than offensive. On the first night of the Mau Than Lunar New Year, 17 liberation soldiers gathered at the house, getting weapons and later attacking the Independence Palace, bravely fighting the enemy. Up until national reunification Day, none of the enemy was ever able to recognise the arsenal, even though they had at one time controlled it. After the war, the house was returned to Lai, who decided to open it to the public so that young generations could understand history and see how clever the Vietnamese people were. Following his desire, even when he passed away, the house remained open to visitors. A visiting Canadian couple told me they had seen many places in their travels, but were very impressed with the house. 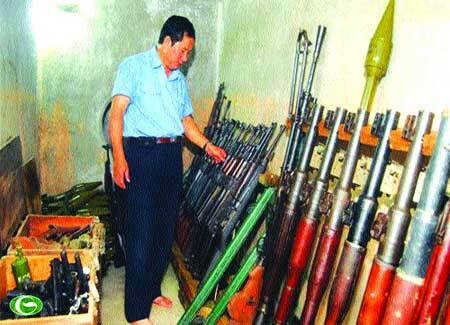 The wife was amazed that so many guns had been hidden away. "There's a lot of power down there. It's scary to think of those times, the secret exits. And it's amazing to think of the Americans right on top of them." Her husband was particularly impressed with the "ingenuity of the people who lived here, and their courage to do this".